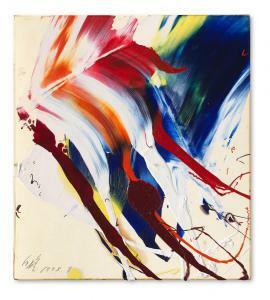 Find artworks, auction results, sale prices and pictures of Kazuo Shiraga at auctions worldwide. Kazuo Shiraga - Four works: i) ii) iii) iv) Untitled i) signed with the artist's monogram lower left; further inscribed by the artist [in Japanese] and stamped on reverse ii) signed with the artist's monogram and dated '64' lower left; further inscribed by the artist [in Japanese] and stamped on reverse iii) signed with the artist's monogram lower right; further inscribed by the artist [in Japanese] and stamped on reverse iv) signed with the artist's monogram and dated '1969' lower left; further inscribed by the artist [in Japanese] and stamped on reverse each watercolour on postcard i) 10.3 x 15 cm (4 x 5 7/8 in.) ii) 9.3 x 14.4 cm (3 5/8 x 5 5/8 in.) iii) 9.3 x 14.1 cm (3 5/8 x 5 1/2 in.) iv) 14.9 x 10.3 cm (5 7/8 x 4 in.) ii) Executed in 1964. iii) Executed in 1966. iv) Executed in 1969. 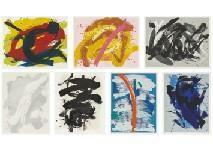 SHIRAGA KAZUO PORTFOLIO 1990 (portfolio) SHIRAGA Kazuo a portfolio of 7 screenprints, 1990, each size 85x65cm, all signed and ed.60, numbered ed. "45" from 60 regular copies out of total edition of 80 on the justification page, published by Hoshida graphics, with an original case, two of them are framed. Kazuo Shiraga 1924 - 2008 signed;signed, titled, titled in Japanese, dated1979on the reverse oil on canvas 194 x 130,5 cm; 76 3/8 x 51 3/8 in. Executed in August 1979. Galerie Georg Nothelfer, Berlin Acquired directly from the above by the present owner Exhibited Berlin, Galerie Georg Nothelfer, Kazuo Shiraga, 1992; catalogue,p. 25, illustrated in colour Literature Kazuo Shiraga, exhibition catalogue at Kobe, Hyogo Prefectural Museum of Modern Art, 2 June - 22 July 2001, p. 124, illustrated Kazuo Shiraga: Painting Born Out of Fighting, exhibition catalogue at Tokyoshina, Azumino Municipal Museum of Modern Art, 25 April - 14 June 2009; Amagasaki, Amagasaki Cultural Center, 18 July - 6 September 2009; Yokosuka, Yokosuka Museum of Art, 31 October - 27 December 2009; Hekinan, Hekinan City Tatsukichi Fuji Musuem of Contemporary Art, 2010, np., no. 264, illustrated in colour Catalogue Note Shiraga is simultaneously involved in two very different aesthetic universes: the existential expressiveness of Western art and the pantheist transcendence of Oriental art. Antonio Saura, Shiraga ne peint pas avec les pieds, exh. cat.Kazuo Shiraga, Toulouse, 1993 In the wake of the Second World War, the revolution in painting – propelled by a move towards Abstract Expressionism by pioneers such as Jackson Pollock and Willem de Kooning in the West – saw a similar development on the other side of the world. 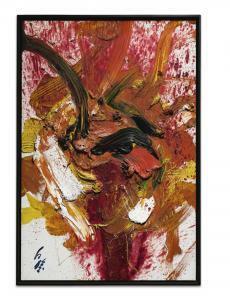 Exhibiting an intense dynamism,Sekito is a stunning example of Kazuo Shiraga's radical 'performance paintings'. 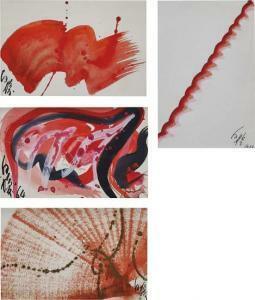 A pivotal member of Japan's most remarkable avant-garde art collective – TheGutai Bijutsu Kyokai(Gutai Art Association) – Shiraga's technique epitomises the group quest for a radical new artistic expression. Gutaï itself arose from another movement called Zerokaï and founded by Shiraga in 1952 with the aim of creating an art free of all intentions and conventions. The conjunction ofgu(instrument) andtaï(body), Gutaï praised the reconciliation between the body and matter, between the energy spent by the artist's action and the medium of its expression. 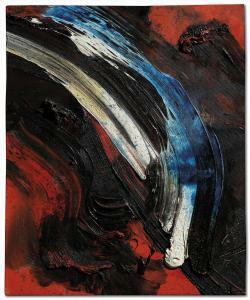 By placing his works flat on the floor and using his feet to spread thick layers of paint across the surface of the canvas in energetic gestural moves, Shiraga wanted to "paint as though rushing around on a battlefield, exerting" himself "to collapse from exhaustion" (Kazuo Shiraga quoted in: Exh. Cat., New York, Mc Caffrey Fine Art, Kazuo Shiraga, 2009, p. 59). The uninhibited action allowed the artist to fully immerse himself in the work, merging body with matter in a fluid, explosive, visceral synthesis. Executed in 1979,Sekito,The Red Devil (or Red Hare)belongs to the corpus of works by Shiraga, known as theAncient Chinese History Series. Sekito refers toan extaordinary horse owned by the warlordLü Bu, who lived during the lateEastern Han dynastyof China. Sekito mentioned inLü Bu's biographies in the historical textsRecords of the Three Kingdoms was described as a super powerful animal "capable of travelling 1,000liin a day. [...] crosses rivers and climbs mountains as though it is moving on flat land, [...]". After Lü Bu's downfall and death at theBattle of Xiapi,Sekitocomes into the possession ofGuan Yuthe general who played a significant role in the events that led to the end of the dynasty and the establishment of the state of Shu Han in the Three Kingdoms period. It comes as no surprise that this story was a perfect inspiration for Shiraga. The compositional complexity ofSekito continually fluctuates between rhythmic calligraphic sways and the disorganised chaos of unrestrained action painting. Sekitoradiates with chromatic potency as sumptuous strokes intersect in a mesmerising dance. With its frenzied poetic chaos and vibrancy, the painting is an arresting vestige of the innovation that most defines Shiraga's unique visual language and artistic philosophy. Like Yves Klein, who utilised naked women as 'human paintbrushes' in hisAnthropométriesof the late 1950s and 1960s, and Jackson Pollock, who showed a distinct interest in the expressive idiom of the radical Japanese artists, Shiraga developped such a visceral gestural language that his radical paintings stand as exceptional milestones in the history of twentieth-century art.